B&M Telecom, Inc. is a proven leader in the Telecommunications Industry,established in 1987 by Jim Ballard in Mansfield, Texas. 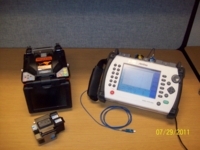 Centrally located in the Dallas-Fort Worth Metroplex area (with another office in Ocala, Florida), we provide Fiber Optic Splicing, Testing and Consulting Services throughout the United States. We realize the importance of meeting our customers deadlines without sacrificing safety or quality utilizing the latest in equipment and technology. Our goal is to provide our customers with fiber optic cabling services they can rely on and trust. OSHA Training – Foremen and technicians receive 30 hours. IMSA Work Zone – Traffic Safety Training as of 11/10. B&M has consistently provided outstanding service to AT&T for many years. Their attention to detail and their ability to troubleshoot and resolve complex issues is surpassed by none. I offer my sincere gratitude for the exceptional work performed during crisis situations and emergency restoration work. B&M team members maintain the utmost professionalism and technical knowledge that is critical to maintain AT&T’s fiber network. With B&M’s loyalty and devotion to placing the customer first AT&T will keep B&M as our preferred vendor of choice for many years to come. B&M Telecom provides premier fiber services at competitive prices that are "second to none". They have assisted us with multiple projects requiring little or no supervision while onsite. When we contact B&M Telecom we know the job will be done right the first time. We have been working with B&M for approximately 10 years. They helped us clean up a fiber backbone for one of our customers which improved the transmit time for the engineering dept. from minutes to seconds. They confirmed the fiber did not need to be replaced; just cleaned and some of the connectors needed to be replaced. The return on investment (ROI) for the customer was immediate due to the employees being able to work more efficiently. B&M has provided a number of services for our clients including testing, cleaning, documenting, splicing, installing and terminating fiber. They have well trained professional personnel. It is a pleasure to do business with them. I would like to thank you and your team for the excellent work you have done for us on the Grand Prairie project. It was evident that after our kick off meeting they knew exactly what to do, and how to do it without repeatedly explaining the scope of work. Your attention to detail on the documentation and schematics that you provided was an added bonus and made me look even better than expected. Thank you for all the hard work and making this project a success. I look forward to working with you on any future projects. Thank you. Philip Stumbo - President, America Intellicom, Inc.
We have always had a good working relationship with B&M. They are quick to respond to our fiber needs and helpful in assisting us with quotes for fiber projects. They have helped us in getting awards for some projects. We have always found B&M to be a good, reliable, trustworthy contractor to deal with and look forward to many more years of working with them. As a carrier services provider in the wholesale market, Consolidated Communications Inc. takes great pride in providing quality products at fair prices. One way this is accomplished is through the tremendous efforts demonstrated by B&M Telecom and all of their associates. CCI has utilized B&M Telecom almost exclusively on our entire Dallas-Fort Worth area Outside Plant and take great comfort in knowing they are on our job site. Brian K. Story - Supervisor, Consolidated Communications Inc. Copyright © 2011- 2019 B&M Telecom, Inc. All Rights Reserved.